Deepika Padukone has time and again proven that she is not only an idol to her fans but also an ideal daughter. The actress has always been there for her family no matter what and has taken out time from her gruelling schedule to spend time with them. Deepika often takes out time from her tight schedule to make time for her family. She not only visits them but also travels with them. The actress travelled to Ganga ghats with her mother for the holy prayer. Deepika also spared time to visit and help her family in Bangalore while they shifted from one house to another. Recently, Deepika Padukone travelled to Delhi for her dad's lifetime achievement award ceremony right after Padmaavat's release. Deepika Padukone has always been vocal about her close bond with her father. On this Father's day when asked her if she was her dad's little angel or a strong support system? The actress shared, "I think a bit of both. I think its a little bit of both, I would like to say that we have a wholesome relationship. Well in certain situations I am a little girl in certain situations I stand up for the occasion in support be it emotional or otherwise. Sometimes joking with each other, pulling each others' leg. Sometimes while growing up days, reprimanding me, locking me up in the storeroom if I would misbehave. From father to friend, we share every kind of relationship. So we share a wholesome relationship that way." 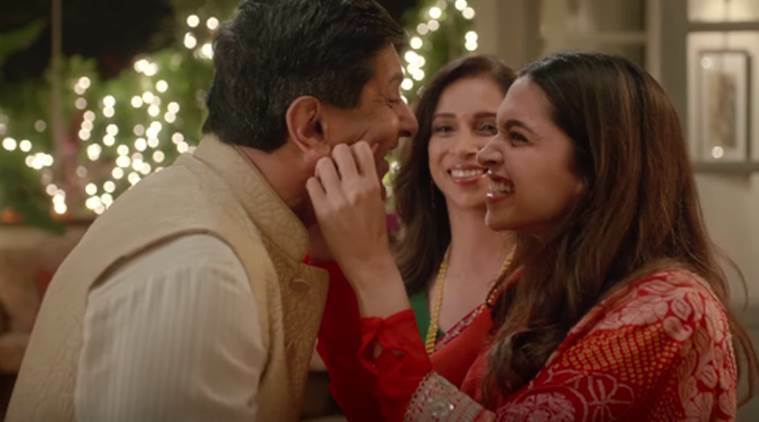 Deepika was very young when she left Her hometown Bangalore and shifted to Mumbai, and that's how Deepika transformed from being dad's little angel to a strong supporter. She became one of the highest paid actresses in the country so taking all the decisions by herself would be a bit difficult as they not just affect her but the family too. To which Deepika said, "Fathers I wouldn't say, but parents approval yes, of course, that matters. In that sense for me, in every other aspect of my life, their approval or disapproval matters and keeping them in a loop is very very important. And largely I have their blessings. I wouldn't be where I am today if I wouldn't have the support system in them. If I constantly had to worry about what my parents are thinking or they are ok or they are upset with my career choice I don't know if it would be the same journey that I have had. I am not saying that it wouldn't be the same way or the other way but the fact that they've both been extremely supportive had a huge influence in my life and that for me seeking their approval and as parents you want to keep them informed as to what you are doing. They never really interfere in my work or professionally if I had to say. In fact, in the ten years of my career, you have hardly seen them around. They trust the professionals that work with their, own daughter who they left to go to another city to live. They trust that I would make the right choices at the right time. And of course, as parents, they have been there through every step of the way imparting life experiences imparting knowledge whatever it is that they think will enrich or nourish my life or my decisions further though eventually, they have left the decisions onto me whatever it has been in my life." Someone like Deepika who has travelled across the globe has got many gifts for her father but spending time with him is the biggest gift. She cherishes the time spent with him. When asked her about it she said, "I think it's our time that we spend together. And I genuinely see the joy when they get some time to see me. The way he walks into the house and it's a joke in the house that he breaks into a smile that we don't see very often it's like a broad joy from within and same when I go to Bangalore he puts all his commitments aside my mum starts joking as she says he doesn't need to go to office like he's always around and he'll always be there. He wants to be available for me and there's no agenda it's not like we are going out anywhere or anything but he just likes to be around. And he looks forward to me being there and does small things like dropping me to the airport because the drive to the airport for 40 - 45 mins is precious because we get to spend time with each other these simpler things of just being there and being in each other's presence that's what matter the most to us."